Oh My Gosh, What Happened To Paraguay? And China, You Are So Big! 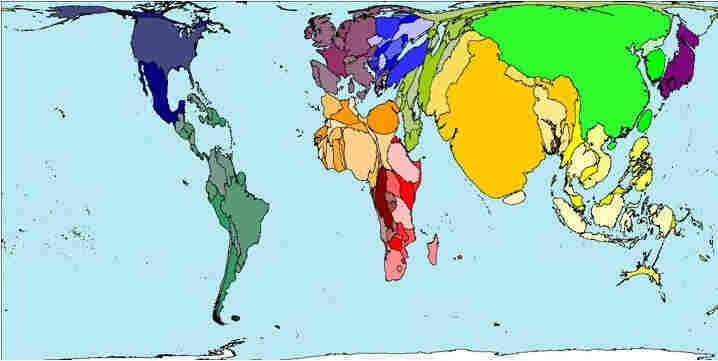 : Krulwich Wonders... A series of world maps show you where the richest, fattest and smartest people live. You can also spot the country that exports the most chicken and where you are most likely to be killed by extreme temperatures. Oh My Gosh, What Happened To Paraguay? And China, You Are So Big! Most maps let you see where places are. These maps let you see where people are. Choose a “people category." Ask where rich people are, poor people are; ask which country has the most internet users, chicken exporters, people killed by extreme temperatures (map 253) and they’ve got a map for that. When a country has lots of examples in a category, the country inflates like a balloon. When the country has less, it deflates. So in the animation “Land Area To Population," Chile and Gabon shrink to a whisper of their usual selves. China swells gigantically. The animations make you see countries “become” above or below average. I love these. In a lot of these maps, the USA has a slightly glutinous quality, but if you want a patriotic swell, check out this map, which shows you which country is making the most money selling ideas. Balloon maps were especially popular 5 years ago. They may not be making as many of them these days. They come from a bunch of map geeks at the University of Sheffield in England led by Danny Dorling, Graham Allsopp, with a boost from a University of Michigan computer designer, Mark Newman. They call themselves Worldmapper.